← Itâ€™s all a lie! Earth Bound Baby embroidered cord ties are a comfortable, soft, gentle and safe alternative to the traditional obtrusive hard plastic hospital clamps used on your babies umbilical cord, making skin to skin and breastfeeding and more comfortable. 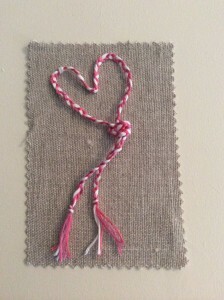 These pretty cord ties are handmade and are very simple to use. The umbilical cord ties are individuallyÂ handmade from 100% cotton embroidery thread and come in pairs. Each ties is approx. 30cm long and are available in pink, blue or natural. The cord ties come in a cotton bag with full instructions for use are included with every set to give to your midwife. The cost for a pair of cord ties is Â£12 including delivery. Please email me at amanda@earthboundbaby.co.uk if you would like some sending by post.